Since this blog is used as a way to inspire artists, it's only appropriate to post some of my own work. A Close Encounter at the Edge of the Woods was inspired by snowfall around the new year. 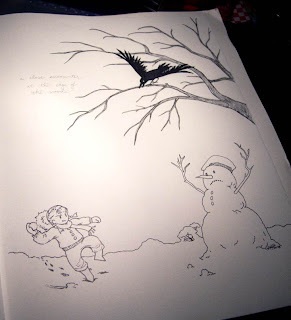 In this drawing, a feisty young girl is caught off-guard by her encounter with a larger stranger, who, having the unfortunate fate of being a snowman, cannot retaliate. Aside from the facial expressions, I really enjoyed patiently etching out the patterned tree bark, probably subconsciously inspired by the beautiful forestscapes of Stephanie Pui-Mun Law. After a period of not drawing, I find that sketching faces is the easiest way for me to ease back into the habit. 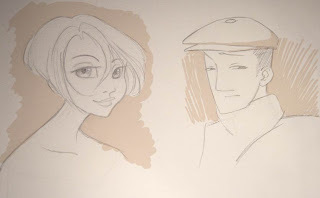 Just two generic characters here, although the cap on the chap is inspired by the snowman's hat in the previous pic. For me, drawing poses is a little harder than faces and takes a bit more effort. I usually don't use references for my drawings, so being able to imagine everything and execute it so that it looks natural is always a challenge. Here, I was just trying a variety of different things so I can get used to imagining the human body again. I felt like everything here is pretty incoherent, but I am hoping to get better with practice! Have you ever taken time off from a hobby then decided you wanted to get back into it? What kinds of hobbies do you have? If you like to draw, what kinds of things did you start with? 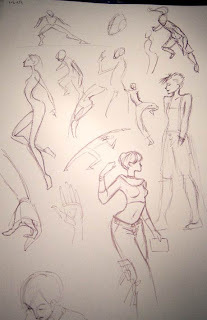 If you have any sketches you did this week and would like to share, I would love to see them in the comments section. your art always has this really great flow in it!